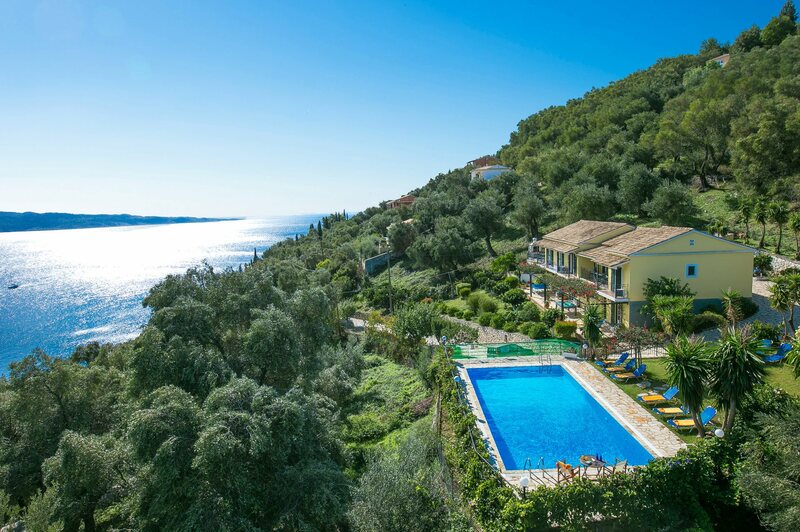 The perfect choice for larger families or groups, Villa Caribia is a spacious 7 bedroom Corfu holiday villa with a large private swimming pool and stunning views over the Agios Stefanos countryside to the sea and Albania on the horizon. Located close to the bays of Agios Stefanos and Kerasia, Villa Caribia has the beach and a selection of shops and places to eat within around 20 minutes on foot, or 5 minutes drive. It is split over 2 floors, with a self-contained annexe on the lower level. WiFi, pool heating and air conditioning/heating in 6 of the bedrooms and the annexe lounge is included. Spacious and stylish throughout, with a large pool and wonderful views - perfect for a large family holiday! The driveway leads past the side of the villa to a private parking area with ample space for your cars should you choose to hire them. Entry from the private parking space is directly into the ground floor kitchen and dining area. A hallway to the right leads to the lounge and both the living and dining area have patio doors onto balconies overlooking the villa grounds to the sea. The annexe level is self contained, with external access only. Guests can make use of a seperate lounge and kitchen - ideal for families travelling together! To the left of the dining area are 2 twin bedrooms which share an adjacent shower room. The twin bedroom at the front of the villa has a small private balcony with sea views. On the right is a twin bedroom and 2 double bedrooms with 2 separate bathrooms. The remaining twin and double bedrooms are on the lower annexe floor of the villa. Both bedrooms share a shower room. The annexe twin bedroom does not have air conditioning/heating, but the living area does. This villa is registered and licenced by EOT Greek licensing association. This number is: 0829K122K4583000. Located close to the resort of Agios Stefanos and the white pebble bay of Kerasia, Villa Caribia sits on the hillside overlooking the Corfiot countryside leading down to the sea. The area is an ideal base from which to explore the North Eastern part of the island and is ideal for large groups or families holidaying together, with the neighbouring resorts of Kalami, Avlaki and Kassiopi just a short drive away. Agios Stefanos beach is small but very pleasant and has a number of cafes and tavernas to choose from overlooking the water. Alternatively, the bay of Kerasia is around 5 minutes away by car. With its' pleasant pebble beach and crystal clear waters, the bay is well worth a visit. Or try the white pebble beach of Avlaki where there is a chance to horse ride around the nature reserve of Erimitis. There are also a couple of excellent tavernas overlooking the beach and water. Kassiopi also has a number of small beaches a little further around the coast from its magnificent harbour. There are a number of small coves ideal for snorkelling and soaking up the sunshine, and when the sun goes down, enjoy any one of the traditional tavernas, select restaurants, music bars and or karaoke venues. Agios Stefanos has a good selection of shops and places to eat all within easy access by car or on foot. You can enjoy a traditional meal at any of the tavernas as you watch the sun set over the water, or visit the mini market and buy something to cook yourself on the BBQ! For anyone who wants to see more of what the island has to offer, the popular family resort of Kassiopi has a larger selection of bars, tavernas, shops and restaurants and is around 15 minutes drive along the coast. If you're feeling adventurous, why not hire a boat and explore the villages and beaches in the North of Corfu by sea? Or enjoy any of the watersports which can be found at almost any of the larger beaches on the island. For famlies, there are 2 waterparks within easy reach, one in Acharavi, around a 20 minute drive from the villa, the other on the way to Corfu Town. Corfu Town itself is well worth a visit during your stay and can be reached in around 45 minutes. Explore the never ending maze of streets with gift shops, cafes and restaurants. Or enjoy a leisurely walk around the harbour area by the Fort which, at night, offers some of the most spectacular sunsets on the island! Villa Caribia is not available to book for season as it is sold out. Take a look here at the Corfu villas that are currently on sale. Villa Plus exceeded all expectations.